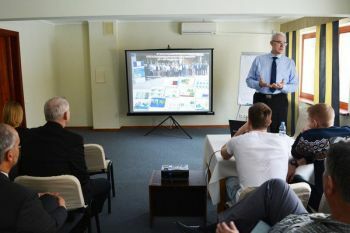 Speaking at Siberia’s Omsk State Technical University, the compression expert explained how world-leading SCORG software techniques developed at City can be utilised for compressor design in the Russian oil and gas industry. City, University of London’s Howden Chair in Engineering Design and Compressor Technology, Professor Ahmed Kovacevic, gave the keynote address at the 9th Oil and Gas Engineering International Scientific and Technical Conference, held from February 26th to 28th, organised by the Petrochemical Institute of Omsk State Technical University. On February 27th, Professor Kovacevic gave a presentation titled ‘Applications of Computational Fluid Dynamics in Screw Machine Modelling and Design’. 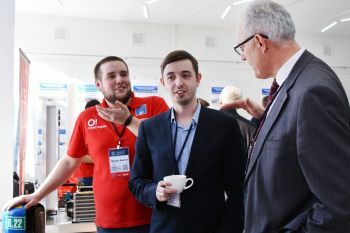 He told participants that by using novel techniques for the modelling and design of oil-injected screw machines developed at City such as the Screw Compressor Rotor Grid Generation (SCORG), software, it is now possible to design more efficient and robust screw machines for the Russian oil and gas industry. The SCORG software was developed from research carried out at City’s Centre for Compressor Technology and allows for the critical analysis and design of positive displacement compressors, expanders and pumps by use of Computational Fluid Dynamics (CFD) and lower order models. This has also led to the formation of City spin-out, PDM Analysis Ltd, and has helped screw machine manufacturers such as Howden (UK); Kirloskar (India) and Ingersoll Rand (USA) to introduce new superior products in the market. Professor Kovacevic was also invited to deliver a seminar for prospective students from Omsk, Moscow and St Petersburg on the benefits and techniques regarding the use of Computational Fluid Dynamics (CFD) in the design of Screw machines. The studies presented by both Russian scientists and company representatives were at a high level and I have already shared them with academics and students here at City. The Omsk region in Siberia is among the largest manufacturers of oil and gas in the world. Gas extracted from that region is supplied to continental Europe. Russia produces approximately 870 billion cubic meters of natural gas - slightly lower than that produced in North America. Gas production until 2040 is expected to grow at a 32 percent rate with gas demand for the Russian market being substantially smaller than its rate of production. The conference was organized with the support university of the Omsk Region and the Institute of Catalysis of the Siberian Branch of the Russian Academy of Sciences. The general sponsor was the leading enterprise of the petrochemical cluster of the Omsk region - JSC Gazpromneft-ONPZ.